This evening proved to be a particularly challenging time for outfit photos. It was warm, the trees were flowering, and it seemed like all 28 thousand of my towns' residents were out in the center. I realize you can't tell because these are the five photos out of the 100 I took where I appear to be alone... but they are there. Photobombs galore, me rushing over to the tripod whenever I saw an errant dog on a long leash headed my way... all the while the only thing I could think was, "This is my sidewalk and you don't belong here. Where were you all winter when it was deathly cold? Because I was here. I've earned this." Self photography struggles aside, I really liked this outfit and I have a few new pieces like this peach cardigan from the Loft, which was on super clearance for about $10. I also have a new ring from the thrift store which was only $5! I love that sweatshirt dress! A few of my friends have it and it's super remixable. Stopping by from What I Wore to Work! Don't bike riders, people enjoying evenings with their families and pedestrians know that they ruin blog shots? Sigh. This dress is so perfect! You look insanely gorgeous in it! so pretty friend! totally love the neutrals..so feminine and chic! I love the flirty cut of this dress...it is so cute on you! Soon I'm going to be dealing with hoards of people at the Jersey shore in the summer so I understand! Such a cute look! And dumb people! Why must they always get in the way...psh! Ha ha that's funny! Well you look amazing! I love this look. One of my favorites of yours. I can't believe you take these photos yourself! They are amazing! I can't take pictures in front of other people because I look like I'm possessed and am too embarrassed! I have my mom take them in her back yard haha Bravo for being brave :) Oh and your look is fab as always - I am in love with that dress!! I love love that cardigan: the color and the fit. I also love the entire outfit. Looks really good. I didn't even know we sold that necklace at Avon. LOL No doubt!!! I wish we could just barricade a section for photos (although that might attract more attention . . .). You're right--you've earned it! I love the peach and grey today! What a great color combo! 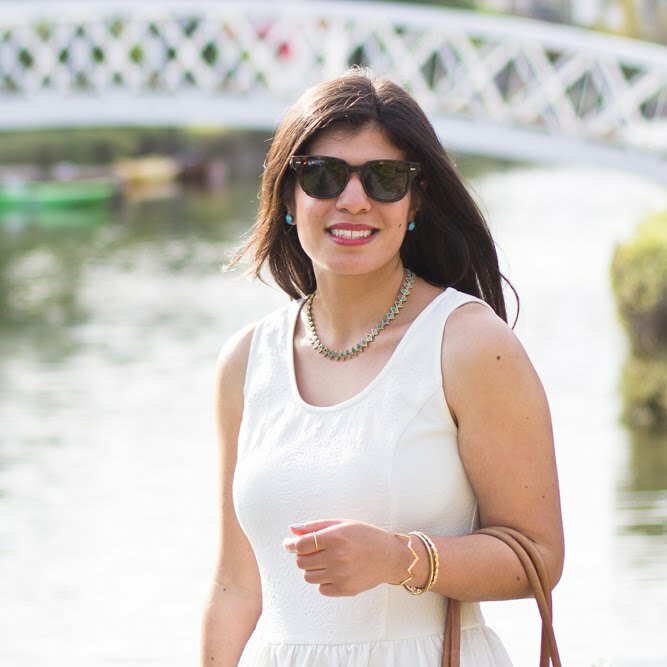 Effortlessly chic! Love it! Cute clutch too! Haha...it IS your sidewalk! Tell those people to go away! Luckily the sidewalks where I take photos are pretty dead but i get super shy when someone walks by. I hate it! Anyway, I love how you accessorized this dress! The peach cardigan is so pretty! Amazing colour combination! What a lovely look, Lyddie. Oh my, that feeling sounds all too familiar! As much as Paris was the most beautiful background for photos, I was out and about taking them no matter what the weather. And when the sun finally came out, so did all of the tourists. Ian and I had a joke about how people in bright red jackets seemed to follow us around, appearing just as he pressed down on the shutter. It seems funny in retrospect, but at the time it was incredibly frustrating. Suffice it to say, I feel your pain. but these beautiful photos were certainly worth it. 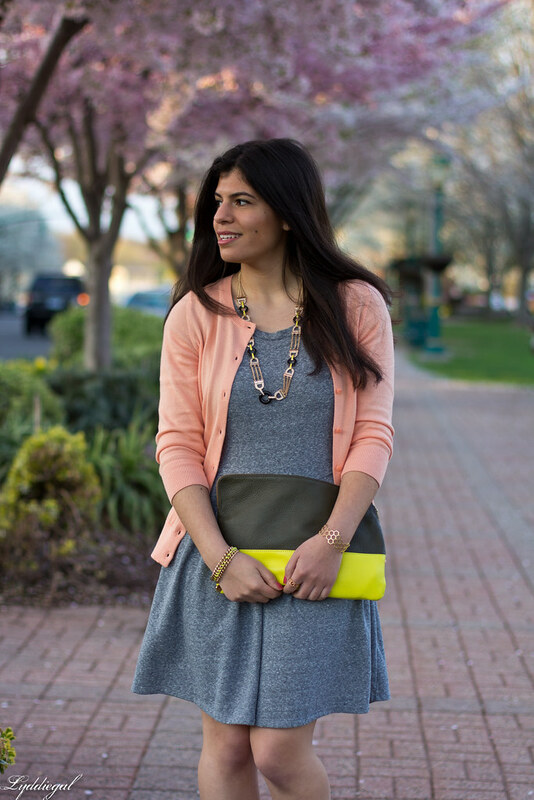 Between the sweet cheery blossoms, your beautiful gray dress and pop of peach from your cardigan, everything about this look is so perfectly spring and I love it! You look gorgeous. That cuff bracelet is amazing. I love this dress and clutch, great combo for spring! You look fab! I love your dress with the cardi. Looks so sassy! Kisses, lovely. Lydia, you did a great job girl! You look so composed. I would never know. That peach and great looks amazing together. I really thought you had a photographer all this time. You done good and look Fantastic in this outfit. You owned the street here. .
Lydia, you're amazing. To take beautiful self photos is just something. You have done really good job, because I've would never think that at that moment you was surrounded by many people. I understand your frustration. Been there, done that.Years ago we did photo shoot in Dublin city center. I was surrounded by people passing me by and to be honest photos came out great. But for your photo shoot in these pretty cherry blossoms Is so wonderfully that you stand out in your gorgeous look. Love that grey dress paired with pretty peach cardigan. Argh - that would annoy me so much! You're such a pro though that your face doesn't even register the displeasure. You do such a great job taking your own photos. This is a lovely look I love the sweater such a great price. you amazing photos! the location is beautiful and you look so pretty! This outfit is really pretty. I don't think I'd do well with public photos, I wouldn't have the patience to take 100, that's for sure! I agree you own that sidewalk ! Oh and you are wearing that pretty grey dress I like so much. LOL You cracked me up about the oncoming dogs. My two would totally take down your tripod! Looks like a gorgeous evening, even if there were stupid people out trying to ruin your pictures. Love the grey and peach combo! By the way, lovely outfit. I love your clutch. You look so adorable, love this color combo. 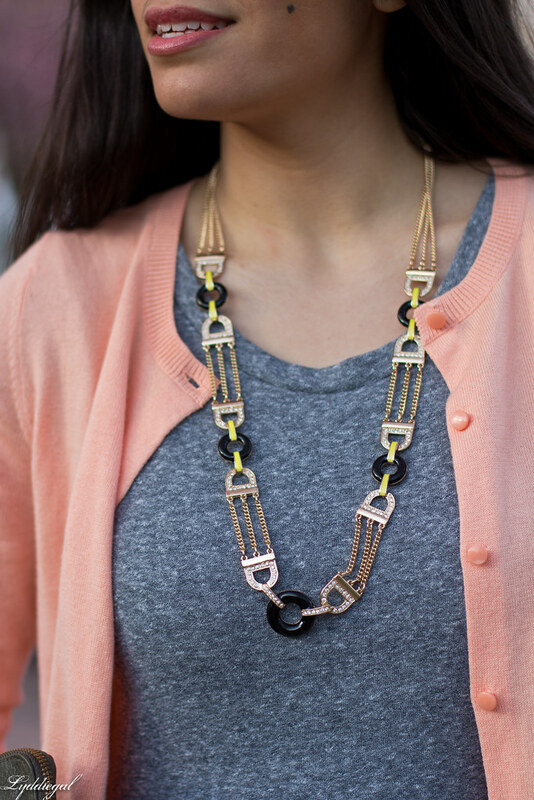 Love the color of your cardigan, and the necklace is so pretty! This is such a great look. I love all the pieces and the color combination is amazing! Your pictures are great! No one would know that you had to fight for space on the sidewalk. I always thought that your pictures were really good and wondered if you did them yourself. These are no exception even if you were distracted by those jerks Ha Ha. I love this color combination and that necklace goes perfectly. It amazes me and makes me appreciate photos even more when I read that the blogger takes self photos with a tripod! I do it when I absolutely have to - but I do it around my house - where my only challenge are whether my neighbors see me! So impressive! I love how you accessorized your outfit. The necklace and bracelet are gorgeous. I love that peach color on you! And I completely feel your pain when it comes to photo bombs! I do a few of my photos during lunch break each week, and people are crawling around everywhere now that it's warmer! Soooo many great dresses lately. I love it!! I would love to feature one of them next Wednesday in my "Spring Must Haves" series with Ada. We talked about statement dresses this week. Would that be alright with you? Do you have a preference on which dress? Amazing find, you are so good at finding the best deals! Loving this beautiful Gray Fit+Flare dress and even better that it is gray which is my favorite neutral. Looks perfect with the light coral cardigan (great deal!!) and that gorgeous necklace. I just purchased 2 Fit+Flare Dresses that I cannot wait to wear. We should definitely feature your chevron dress or this one, next Wednesday. I love how grey and peach look together, great style!!!! 2. you take your own photos when there are (lots of) people & dogs around to gawk. And you still look wonderful. I'm still so impressed that you take your photos by yourself in public. I get so freaked out even when Dave is with me. I'm starting to get over it, though. When we were in Louisville last weekend, we documented every outfit and I didn't care who was around. Now if only I could have that same outlook back home!